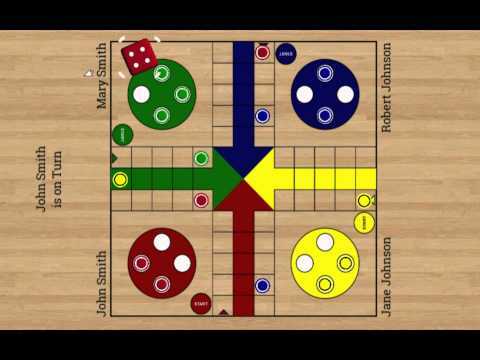 Ludo Parchis Classic Online is a board game for two up to four players, in which the players race their four tokens from start to finish according to die rolls.FEATURES – Multiplayer (up to 4 players) – Play with friends on one device or over the internet- Play against Android- Rolling dice using real physX, bouncing of the sides- Dice changing color according to color of actual player on turn- Achievements- LeaderBoard Online- Name the players- Auto move when there is only one possibilityhttps://www.facebook.com/SpanasGamesGAMEPLAY (Rules)To enter a token into play from its staging area to its starting square, a player must roll a 6. If the player has no tokens yet in play and does not roll a 6, the turn passes to the next player. Once a player has one or more tokens in play, he selects a token and moves it forward along the track the number of squares indicated by the die roll. Players must always move a token according to the die value rolled, and if no move is possible, pass their turn to the next player.When a player rolls a 6 he may choose to advance a token already in play, or alternatively, he may enter another staged token to its starting square. The rolling of a 6 earns the player an additional (“bonus”) roll in that turn. If the additional roll results in a 6 again, the player earns an additional bonus roll.A player may not end his move on a square he already occupies. If the advance of a token ends on a square occupied by an opponent’s token, the opponent token is returned to its owner’s yard. The returned token may only be reentered into play when the owner again rolls a 6.